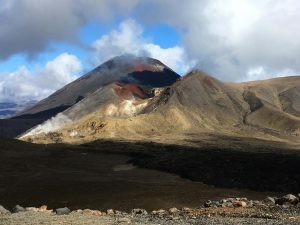 When I came to New Zealand, I went to visit the Tongariro National Park for a few days before boarding JOIDES Resolution in early May. That was a really magic place, hauntingly beautiful – and it also showed what we are up to! I took the photo up on Tongariro volcano, looking from the rim of the Blue Lake back towards the cone with the Red Crater and behind it the larger cones of volcano Ngauruhoe. You may still see the walking track on the right rim of the smaller volcanic cone in the front, and – if you look very closely – a few tiny people standing on the top of it. Now imagine this all covered by about 1500 m (1.5 kilometers!) of water, which also means that there is no light to see anything. There is only the water surface with a drill ship on, planning to drill three holes in it, of a few hundreds meter length that contain rock cores with 6 cm diameter each. That’s the rock from which we will string together an image of the undersea Brothers volcano together – which is diverse as the Tongariro volcano……some of the rock we already have, and can hardly wait for our drilling crew to get up more for us to study more of the secrets only Brothers can tell!